On Track to Reach $300,000 Guarantee in 12 Months! This is a bit of a lengthy interview, but it really speaks for itself. 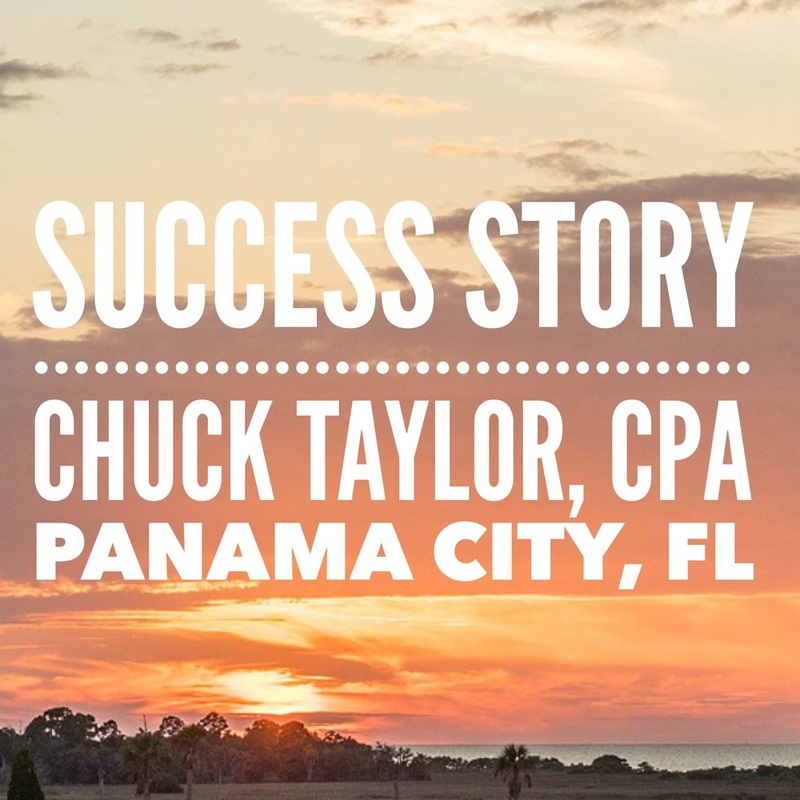 Chuck has been running the program for only six and a half months and has achieved phenomenal results during that short time frame. He is on track to reach his billing guarantee within 12 months (as opposed to the 24-month time frame that the guarantee allows for). Chuck has a lot of great insight into why the NCI program works so well, how this compares to buying a practice and the importance of being prepared to handle the influx of growth the program will produce. Please tell me about your business and accounting background, starting with where you went to college up through acquiring a practice. I was the third of three children and my older brother and sister spent all their college money and mine, so I ended up working my way through college at a local university. I attended 13 straight quarters and was graduated top of my class in ’89 and then went to work in Montgomery, AL, which was two hours from where I lived. I decided I needed to go to graduate school so I took the GMAT and did really well. I was offered a scholarship to Ole’ Miss and applied to the Wharton School so that got the wheels turning. I also applied to a couple Ivy League schools and was accepted by Cornell, but I thought about having to pay back $100,000 in student loans and got cold feet about attending. So I moved back home. I had already passed the CPA exam by then, we were in a big recession, and I ended up taking a position as a controller in a company that was, of all things, in Chapter 11 bankruptcy. With me being the ripe age of 23, it presented all kinds of challenges and it was a real learning experience. After two years of that, I got back into public accounting and worked in a 25-person firm for the next 13 years. I worked my way up to the level of partner and then in 2006, I took a position with one of the firm’s largest clients, which was an entertainment and real estate development holding company. It was a group of about 50 companies and we had all kinds of exciting plans for that. We were able to achieve some phenomenal things while I was there, such as building a $100 million commercial development in 2008 and 2009, which was kind of unheard of at that time. The economy took that company under. In 2010, I decided I was going to get back into public accounting because public accounting is recession-proof. Also, I was in my 40s by then and I wanted something that would get me through to retirement. Several brokers had contacted me in the past, so I started looking for available firms and found one in Panama City, FL, and we acquired that firm in 2010. When you went into practice in 2010, how long were you in business before you decided to contact NCI and undertake the marketing program? I had actually written NCI into the strategic plan I developed while I was in the process of buying the practice. I’ve been following NCI since the first time I saw one of your ads in the Journal of Accountancy about 20 years ago. I had also received information from NCI a few times over the years and had always thought that the program made sense. I was just never in a position to act on it. You attended the Plan 1 Practice Development Seminar in July of 2011, correct? Yes, in the process of buying the firm I noticed that their revenues had peaked at about a million dollars in 2007 and that they had been on a negative growth pattern for the next couple years. By the time I was looking at it, its revenues had fallen about 12%. The 2009 revenues were around $875,000. Given the fact that was during the great recession at its worst point, it wasn’t too terribly alarming and we went forward with buying the firm. That was my first acquisition, so I learned a lot. I also found out they had significant client losses in the second half of 2009, so the firm wasn’t really an $875,000 firm; it was a $675,000 firm. At that point, based on the price that we had paid and the fact that we were purchasing the practice in the middle of the year, I was really reluctant to lay out the capital for the marketing program. I wanted to make sure we could get through the slow season. About ten months into the acquisition, the firm had significant concentration risk with one client that made up 18% of annual revenues and 25% of the revenues during the off season. One of our staff accountants showed that client that they could pay him more money than he was making at the firm and it would save their company a lot of money in accounting fees. So that business went away in May of 2011 and we were scrambling to make that up. It was at that point that I made the decision to attend the seminar and check out NCI firsthand. I knew that I needed Plan 2 but I was reluctant to spend that kind of money, especially after losing the big client. At the same time, I really couldn’t afford for it to not work. So I attended the seminar and came back and implemented what I had learned. In doing so, I learned a few things. One is that the plan works; you make the calls and you get the appointments. I also learned that I couldn’t run a practice and attend five to ten sales calls a week. I didn’t have the time. Lastly, I learned on those sales calls that I could attend, that a lot of the things that hinder an accountant from being a successful salesperson inhibited me, as well. We accountants sometimes struggle with the salesman’s killer instinct to close the sale,. I did realize that if I had a salesperson at the firm, we would be closing more clients, although I did close some myself. So you essentially proved to yourself that the system works by attending the seminar and than implementing it. That then gave you the confidence and determination to eventually upgrade into the Plan 2 program. It did. We made the decision that once we got into the meat of tax season, we would be in a position to launch the Plan 2 program, which we did this past April. At that time, the practice was at around $550,000 in annual billings due to the loss of the large client. How much growth have you and your sales team been able to achieve since starting the Plan 2 program a little over six months ago? It’s been really phenomenal from a growth standpoint. We’ve picked up 30 new clients. Overall, our recurring monthly billings from those clients are just over $6,000. In addition to that, we have our annual compliance work that we bill separately. Added together, the amount comes to about $100,000 in new revenue just from the effort of our Client Service Representative. In addition to that, what we’ve been able to learn during the process through sharpening our own skills and taking more advantage of opportunities that the program provides, is that there is another $40,000 in work that I’ve either cross-sold to the new client base or picked up in referrals generated by the program. Have you seen a good number of referrals as a result of the marketing program? We have. One story that comes to mind about referrals is that our appointment setters had set up an appointment with a business in the local mall food court. Every time our CSR got about a third of the way into her presentation, one of the vendors would say, “Wait, wait, I have to go grab so-and-so for this.” Before it was done, she was giving an NCI seminar in the food court and she ended up making individual appointments with all of them. She also wound up meeting with the mall manager, so we’re excited about that. Going back to the revenue, in addition to the $140,000 we’ve already discussed, as you point out at the seminar, sometimes people don’t sign up for the monthly service right away but they will become an annual client or they ask us to contact them at the end of the year. Right now, our end-of-the-year callback list has 41 names on it. We’re highly confident that we’ll close probably half of those, which would represent probably another $50,000 or $60,000 in revenue. Our CSR also has seven prospects in her pipeline right now that are just pending closing and represent another $30,000 in revenue. There is also some pretty big recurring work that we have out there that we’ve quoted and that we think is going to close in the next quarter, which represents another $40,000. One of those is a group of ten hotels and another is a multi-office medical imaging company that we have the approval for and are just waiting for the principle to get back into the country. Good lord, Chuck, your pipeline is ready to burst! Adding that all up it amounts to $270,000 in recurring revenue in approximately ten months! It is. It’s presenting some challenges for us. I know from the list of questions you sent me that you ask, what is most challenging about the program. Really, I think the biggest challenge is staffing – on two fronts: first, making sure you have enough staff on hand, because the program works so well you need staff who are willing to handle an increased workload; second, you must ensure you have staff who understand what you are embarking on and that they are plugged into your vision. I know this because we I had a few employees in my office who really weren’t on the same page and didn’t see growth as a positive thing. They had their comfort zone setup and didn’t want to deal with more work. They ended up being toxic to the goals of the program and they eventually resigned. In fact, they were discouraging the salesperson from making sales. The salesperson would come in after picking up a new account expecting high fives and he was getting grunts and frowns from these people. It’s interesting that you raise that point. I haven’t heard that much before but it makes sense. The program certainly generates more work for your employees, as your comments have illustrated. In the long run, though, that will mean higher compensation and a more secure work environment. Right, you need to be able to provide that work on a timely basis or it defeats the purpose of the whole thing. I think we covered your concerns before signing on for the program: you were in a tight spot with the two practice acquisitions, and you needed the program to work to build up the practice you had purchased, which had been steadily declining. That’s right, and to go along with that the budget that NCI lays out in your literature. You’re referring to our Plan 2 and Plan 3 projections. Yes, the projections on the cost side are pretty spot on. We found the cost to run our marketing program – when you factor in all the differential costs – to be about $6,000 a month. It took us about six months to get to where it was revenue neutral. That was a good milestone to reach. What advice would you give to other accountants and CPAs who are reading this and considering engaging in either the Plan 1 Seminar or the Plan 2 marketing program? My initial response is to tell them to go ahead and do it. The best time to do it was two years ago and the second best time is today. By attending the seminar, I think you’ll be impressed with the professionalism of the NCI staff and the quality of the information that you see and hear, along with being able to interact with your peers who are in similar situations in business and some who are trying to decide on upgrading into the Plan 2 program. Go there knowing that it is not just a sales pitch. NCI has a long list of satisfied customers like me going back over 25 years who have achieved amazing results. If you don’t believe that, just ask for the empirical data because NCI keeps track of it. You can see that it is a numbers game and like anything in statistics there is a bell curve. If you hit the numbers, you’ll get the opportunities. I think that’s a good thing to point out, especially from an accountant’s point of view since numbers and statistics are a big part of what you do. Like you said, if you follow the program and give it a chance, you will get the results. What has been your largest client signed to date? The largest one that we’ve signed up so far is a $1,500-a-month client. It’s a local magazine that outsources practically their entire backend to us. It was an interesting situation: the publisher was moving to another city so they needed to have someone on the ground that could handle the administration. What about client back-work? Have you been seeing a decent amount of that type of work? What is the largest amount you’ve seen there so far? We’ve had at least five back-work clients who were in the $2,000-$3,000 range, which we found predominant when we were nearing the corporate and individual filing deadlines. We had a number of small business owners who hadn’t done any accounting work for 2011 and who needed their tax returns filed. Back-work has been a learning curve for us and for the CSR in learning how to accurately price and sell it. When we started the program, I had made a big financial commitment and was anxious to get any revenue that I could from it. As I saw the success of the program, I became more and more confident and was able to price the work more appropriately. Plus, as you generate more revenue you generate that luxury. Sure, you refine the process as you gain experience within it. Have you been surprised by the growth you have been able to generate through the program during a tough economic period? I have been surprised. I felt like we were going to be successful, but we’re way ahead of where I thought we were going to be. The program guarantees $300,000 in new annualized billing within the first 24 months, and we have a realistic chance of hitting that within 12 months if not sooner. Wow, plus we are heading into the best time of year to sell these services. Heading into and during tax season is the best possible time, the best is yet to come! As we discussed, you know better than most to prepare for the storm before it hits. Where do you go from here? What is your end goal with the practice? I’m committed to run the program and grow the practice as big as it will get. As for long-term goals, I think technology has brought our profession to a point where time and distance are less and less relevant. Just look at where we are right now. We’ve already generated $140,000 and I’ve invested about $70,000 into the marketing program which is a 50% discount to the market, so you can clearly grow an accounting practice for much less money than you can buy one, as NCI indicates in a straightforward way on their website. The marketing plan is transportable, so I think the future of using the NCI model and taking it to the next level. The delivery of services in our industry will be similar to that of the mortgage industry, where you have origination offices from which you can go into another market and open up an office there and put a CSR to work. You’d have to have somebody onsite that can speak accounting, but the majority of the work would be processed at a headquarters-type office, where you can manage the workflow. I’m of the mindset that you’re either a growing firm or a dying firm, and we want to keep on being a growing firm. Well, you’re certainly on the right track there. To close this interview, could you just sum up your feelings on NCI, our marketing programs, and our staff? We’re pleased, obviously, with the results we’re getting. We’re also pleased with the support of NCI; everyone at NCI that is involved with our program continues to follow up with us regularly. It’s not a bait-and-switch kind of program, you guys are plugged in and your client’s success is your success. You’ve treated us like we’re your #1 client and I’m sure you, like all good companies, treat all your other clients like they are the only ones. I think that’s the case. Jeff Arndt, who sold me the program, has been great. My CSR stays in regular contact with him looking for ideas and he’s been good to us. He has to be part counselor, part psychologist, and part motivational speaker [laughs.] The program goes through peaks and valleys and Jeff helps us get through any slow patches we come across. Luckily, we’ve only had two weeks where we didn’t sign up any clients in the 25 weeks we’ve been running the program. Our CSR is doing a great job. In fact, she signed up three clients this week. That’s excellent; I’ll most likely feature her in an upcoming issue of the newsletter. Chuck, I’d like to thank you for taking the time out to do this interview with me. We appreciate all the kind words and I can’t wait to hear about your continued success.